Can Rye Cover Crop Cause Yield Drag? Cereal rye is a cover crop workhorse. It can help scavenge nitrogen, protect against erosion, fight weeds, and provide forage. It also can be planted later in the year than many other cover crops. 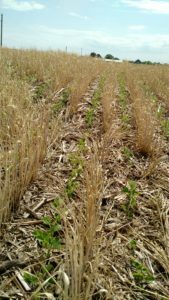 Most producers who have tried cover crops started with cereal rye or a mix containing cereal rye. However, some producers are hesitant to try rye cover crops due to a fear of reduced yield in a following corn crop. 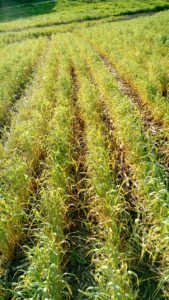 The Iowa Learning Farms and Practical Farmers of Iowa has conducted a study for the past 7 years to evaluate the effect of cereal rye cover crop on cash crop yield. Their results showed that corn and soybean yields were generally equivalent between strips with cover crops and strips without cover crops. The few sites that had reduced yield were thought to be due to insufficient cover crop termination or improper planter settings. They suggest terminating the cover crop 7-10 days before planting to minimize negative impacts on yield. One of the common concerns regarding rye is allelopathy, the release of chemicals that inhibit the growth of other plants. However, according to Bob Hartzler from the Department of Agronomy at ISU, “the chemicals produced by rye probably have little influence on corn growth.” A plant’s susceptibility to allelopathic chemicals is related to the seed size – the smaller the seed, the more susceptible the plant. Corn has a relatively large seed making it less prone to allelopathy. The allelopathic chemicals may function as a natural herbicide and suppress weeds. The decaying rye biomass is also successful at smothering small-seeded, light-sensitive annuals such as lambsquarters and velvetleaf. Rye is promoted as a cover crop due to its ability to scavenge nutrients. However, the nitrogen may be tied-up in the plant in the spring making it unavailable to the corn crop early in the growing season. The potential N tie-up varies directly with the maturity of the rye. One way to minimize N tie-up is to kill rye early (7-14 days before planting), however you want to allow it to get sufficient growth to help protect the soil from spring rains. A way to offset potential yield reduction would be to increase your starter fertilizer rate. The decaying rye will release N into the soil later in the growing season. Soybeans following rye cover crop allow for greater flexibility with termination dates because the soybeans are more tolerant of heavier rye residue. Termination of rye cover crops can be done within a few days of soybean planting and may even allow for termination within a few weeks after planting, depending on the amount of residue. Don Elsbernd, an Allamakee SWCD commissioner, wanted to test later termination of rye when planting soybeans this year. 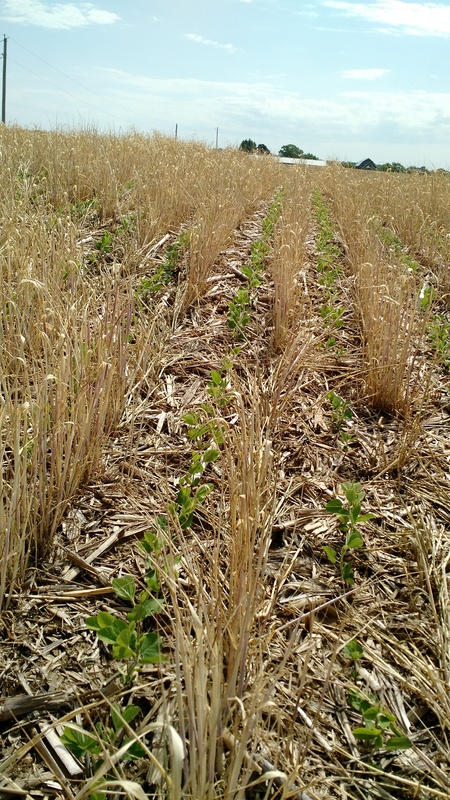 He planted his soybeans on April 26 and terminated his rye cover crop (planted at 1 bushel/acre) on May 16. He will report back at the end of the season to let us know how his yields fared. Photo taken May 21, 2016. Photo taken June 3, 2016.